On November 15, supporters of Mercy Multiplied gathered to celebrate 35 years at Mercy’s annual Evening of Mercy event in Monroe, LA. 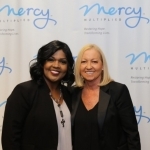 Special guest CeCe Winans, Grammy and Dove Award-Winning Vocalist, performed as the live entertainment for the night and Nancy Alcorn, Founder and President of Mercy Multiplied, encouraged the attendees with hope and inspiration. Al “big AL” Cherry was the Master of Ceremonies for the event. Mercy staff member, Lauren, said, he was awesome throughout the entire night. “Big AL” talked about the reason why he wholeheartedly supports Mercy: because he knows how many women have helped shape the man of God he is today. He continued to say that we don’t know the other Esthers and Ruths that God is raising up to find freedom in Christ at Mercy Multiplied. 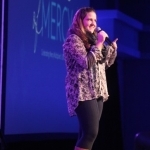 Next, 2017 Mercy graduate, Brittney, shared her story from years ago when she was moved to apply to Mercy after she attended an Evening of Mercy event, just like this one. She shared about how God brought her to Mercy and all that God has done in her life since Mercy and how she has been able to impact others by sharing her story. Pastor Linda Trimble closed out the evening by encouraging guests to give, asking them to link arms and begin to sow a seed for the next 35 years of Mercy and beyond. She added, As we close out our 35th year of Mercy Multiplied we are humbled by the generosity that has flowed in from all over the country to continue to build for the next 35 years of transforming women’s lives. We want to say thank you to all of our supporters and sponsors! Dee and Dr. John Ledbetter, Shelly and Bob McCormick, Covenant Presbyterian Church, Barbara and Dr. Kevin Finley, Bread of Life Christian Ministries, Jackie Churchill, Cedar Crest Baptist Church, C’est La Vie’ Boutique, Dupuy Flooring, Judy and Richard Moore, Kim and Wayne Moore, Sherri Morison, Dr. Stacy and Mr. Andrew Morse, Terri Trichel, and Judy Read. 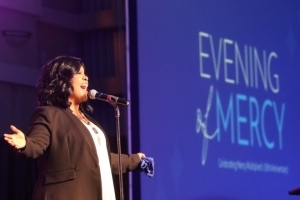 If would like more information about other Mercy year end events happening near you, click here! Claim your seat today to experience a night of Mercy Multiplied that you won’t forget. If you can’t attend an event, click here to donate to sow a seed into the next 35 years of Mercy Multiplied! Thank you!